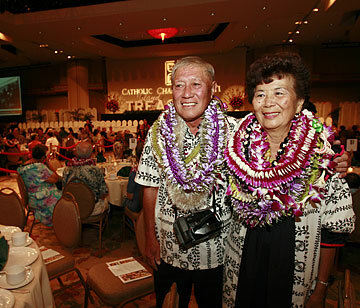 At the Catholic Charities banquet at the Sheraton Waikiki on Friday, Peter and Marietta Kaeo of St. John Church in Mililani were honored by Bishop Larry Silva as "Island Treasures" for their volunteer work. Peter and Marietta Kaeo are honored as "Island Treasures"
It was a week of large and small celebrations for Peter and Marietta Kaeo of Mililani. On Wednesday, they celebrated their 48th anniversary at a dinner out with their family, son Peter Jr., daughter Kim Daly and her daughters Kathleen and Mary. The celebration within the celebration was that their son returned from Iraq in February where he served with the Hawaii National Guard. On Friday, they were among 100 people honored as "Island Treasures" at a banquet attended by 1,200 people at the Sheraton Waikiki Hotel. Surrounding the Kaeos at that event were more than 70 people from their second family, parishioners of St. John Apostle and Evangelist Church in Mililani. "'Treasure' is the word for this pair," said Pearl Bates, outreach director of the church. The Kaeos have been members of the Catholic parish for 30 years and have been volunteers in every activity that makes up parish life for all that time. Bates said the couple tried to dissuade her from nominating them for the annual "Island Treasures" title. Catholic parishes, ethnic communities and lay organizations statewide nominate their outstanding volunteers each year for the event hosted by the Catholic diocese. Fifty-four of the 100 organizations named married couples who, like the Kaeos, are the backbone of their organizations. Like many of the honorees, the Kaeos have served on numerous committees in the parish and are participants at daily Mass. He is an usher, a sacristan and altar server, attending the priest at the altar. She is a lector, doing some of the scriptural readings at the service, and eucharistic minister, distributing communion not just at the Mass, but carrying the sacred bread to homebound people. After the 8 a.m. service on weekdays, they gather with a small group to recite the rosary. But they are activists far beyond their participation in worship services. Peter Kaeo, a retired Army lieutenant colonel who served two tours in Vietnam during the war, points to the parish office where he "invested hard labor and sweat" during its construction. He and other members of the Knights of Columbus, a lay group for men, worked alongside the contractors' crews to build the complex surrounding the church. Marietta Kaeo, retired after 20 years as a public school teacher, has been a religious education teacher at St. John for 20 years. "I want children to know their religion, to have a closer relationship with Jesus," she said. Catechism classes meet on Sundays twice a month. If they kept a calendar, it would likely have a church commitment penciled in for any given day. "If you ask us why, it's because Jesus is the focus of our lives," Marietta said. Yesterday wasn't a day of rest after the festivities in Waikiki. The Kaeos were committed to be "the aloha express" for five senior citizens. They were heading to Star of the Sea Church in Kahala for an all-day spiritual retreat led by the Rev. Peter Prusakiewicz from Poland. That was a break from their usual Saturday morning routine, going out to evangelize in neighborhoods -- not a typical Catholic activity. "They accompany me door-to-door," said the Rev. Tom Killackey, a retired Maryknoll priest. He started his "outreach to the lost sheep and the unchurched" 13 years ago, specifically seeking to bring lapsed Catholics back to church but willing to talk about Jesus to anyone open to the conversation. At its peak, his team included 14 people, but it's down to the Kaeos and a couple of others now. "They are very involved in the church," the priest said. "Their dedication to this work alone is fantastic." The Kaeos take an occasional jaunt to Las Vegas, but most of their travel is on pilgrimages to religious sites. One favorite is in Emmitsburg, Md., a shrine to the first American-born saint Elizabeth Ann Seton. It is near Gettysburg so Peter, a Civil War buff, can satisfy his interest in history, too. They will return to Mexico later this year to the Guadalupe shrine north of Mexico City. Believed to be a location where Mary, the mother of Jesus, appeared to an Indian peasant, it has been the focus of pilgrimages since the 1500s. Typically, the Kaeos are helping others get their paperwork organized for the December tour. And they plan to bring a 3-foot-tall statue of the Blessed Virgin Mary back in their luggage for the church. "I used to go through the motions. After Medjugorje, I became more and more involved," he said. "A friend of mine said, 'Why did you have to go 13,000 miles to get it? God's with you all the time if you open your heart.' That's what happened to me. It opened my spiritual heart." His wife said: "Peter said we'll never move from this parish. It's the center of our lives for 30 years."